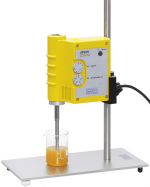 Ultrasonic extraction or sono-extraction is a process intensifying technology, which works by the coupling of high power ultrasonics into a slurry of plant or cell tissue. 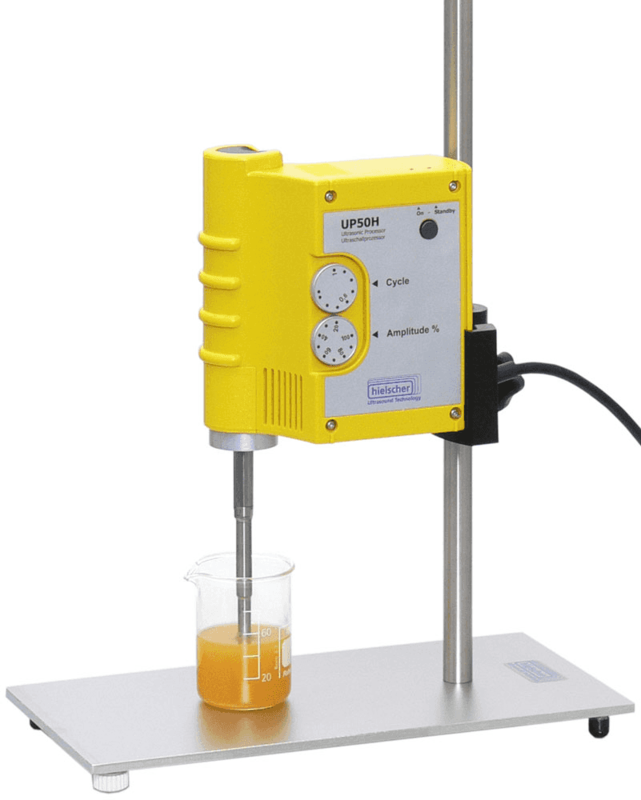 Hielscher Ultrasonics supplies reliable ultrasonicators for cell disruption and extraction from small lab samples up to high volumes in industrial processing. The appeal of the ultrasonically assisted extraction lies in the non-thermal treatment of the material, its easy application and the scaleability from test to production scale. Hielscher’s ultrasonic devices generate high intense ultrasound that can be exactely controlled to your process requirements. The list below gives you various ultrasonic processing protocols, which demonstrate the broad application field of power ultrasonics in biology, food processing and pharmaceutical production. For the extraction experiments, tobacco leaves from Nicotiana tabacum were grinded to smaller particle sizes of about >4 x ≧2 mm. For the ultrasonic extraction trials, 20g samples of dried tobacco leaf materials were extracted with distilled water at temperatures ranging from 5°C to 30°C. Extraction experiments were conducted for extraction cycle time intervals varying from 5 minutes to 30 minutes per cycle. About 10 to 15 drops of ethanol were added to the calculated 256 ml optimum volume of distilled water needed to extract all the soluble chlorogenic acid from 20 g samples of dried tobacco leaves. The 256 ml optimum volume of distilled water was then divided into fractional volumes of the extraction solvent for use in each ultrasonic extraction cycle. For the ultrasonic irradiation, an ultrasonic processor UP400S (400 watts, 24 kHz) with a sonotrode H7 made of titanium, that had a tip diameter of 7mm, was used. The sonotrode H7 was inserted at half height of the extraction mixture. 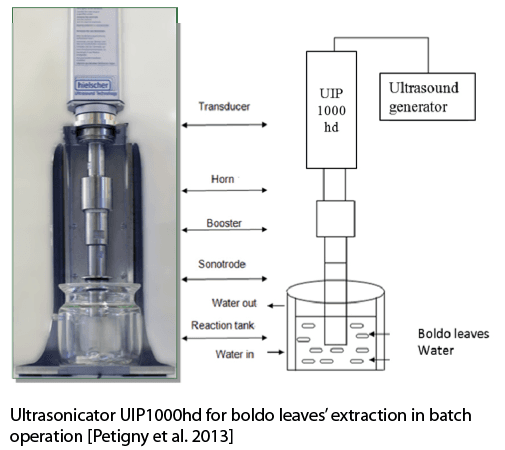 Protocol: As optimal conditions for the ultrasonic extraction of chlorogenic acid from tobacco leaves were found: 20g dried tobacco leaves in distilled water (optimum liquid to solid ratio: 12,8mL/g) at 20 degC processing temperature, ultrasonic device UP400S (400W, 24kHz) for 3 sonication cycles of each 15min (total sonication duration: 45 min). 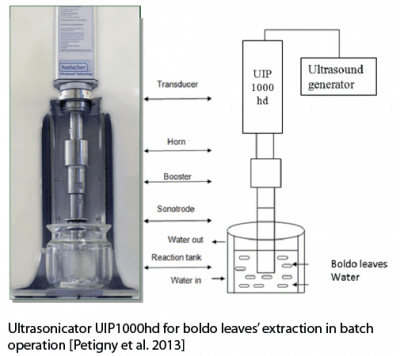 Mazvimba, Martin Tongai; Yu, Ying; Zhang, Ying (2011): Optimization And Orthogonal Design Of An Ultrasonic Assisted Aqueous Extraction Process For Extracting Chlorogenic Acid From Dry Tobacco Leaves. Chinese Journal of Natural Medicines 2011. Ultrasound-assisted extraction was performed by using an ultrasonicator UP400S. In this study a horn-type ultrasonic probe was used with a diameter of 1.5 cm. 10 g of nonfat milk thistle powder was weighed accurately and dissolved in 100 mL of methanol. The beaker was kept in a water bath and maintained at a temperature of 25°C. The milk thistle powder dissolved in solvent was sonicated for different time intervals (30, 60, 90, 120 and 150 min.) After each time interval, the solution was filtered through a Whatman filter paper and each filtrate (about 80mL) was evaporated using rotary evaporator until reached 30 mL solution and the absorbance of phenolic compounds was measured with UV-Visible Spectrophotometer at wavelength of 517 nm according to DPPH method. As expected increasing extraction times resulted in increasing silymarin contents. The authors of the study found that ultrasonic extraction in order to obtain the alcoholic extracts is one of the best techniques to replace the conventional techniques. The ultrasonic extraction was proven to obtain a better extract quality. Further benefits are time-saving being more efficient etc. Çağdaş, E.; Kumcuoğlu, S.; Güventürk, S.; Tavman, S. (2011): Ultrasound-Assisted Extraction of Silymarin Components from Milk Thistle Seeds (Silybum Marianum L.). GIDA 36/6, 2011. 311-318. The extraction of volatile compounds, such as terpenes, from the inflorescences of a fiber type Cannabis sativa L. cultivar can be ultrasonically enhanced. Studies have shown that after a short sonication the targeted terpenes are already released from the plant material. The results show that ultrasonic treatment not longer than 5 min allows to obtain an enhanced concentration of terpenes in comparison with maceration. Instead, an ultrasonic treatment longer than 5 min increased the concentration of δ-9-tetraidrocannabinol (THC). The ultrasound-assisted extraction of terpenes was carried out using an 200W probe-type ultrasonicator. The ultrasonic device was set at 25% amplitude. Three aliquots of 50g of dried inflorescences were added each with 250mL of 70% ethanol v/v, which was used extracting solvent. Each beaker and its content were immersed into an ice-bath. Sonication was carried out for 5, 10 and 15 min. During the ultrasonic extraction procedure, a continuous rapid heat dissipation was ensured to maintain the process temperature below 30°C. After extraction, the mixtures were filtered under vacuum through Whatman No. 3 paper, and the solvent was removed by a rotary vacuum evaporation. Each extraction trial was performed in triplicate using three different samples. Ultrasonication was found to be an interesting alternative to maceration for extracting volatile compounds from cannabis inflorescence, but shows also that the ultrasonic treatment must be not longer than 5 minutes to obtain an enhanced recovery of terpenes. Instead, an ultrasonic treatment longer than 5 minutes increased the concentration of δ-9-tetraidrocannabinol (THC). The extract of Cannabis sativa inflorescences obtained by ultrasonic extraction carried out for 5 min could be used as ingredient for perfumes or flavoring for beverages. It can be used as alternative for industrial hemp, where stems are used for the fibre industry and inflorescences extracts for cosmetic and food industry. Da Porto, C.; Decorti, D.; Natolino, A. (2014): “Ultrasound-assisted extraction of volatile compounds from industrial Cannabis sativa L. inflorescences”. IJARNP 2014, 7/ 1. 8-14. Vanillin extraction was optimized under sonication. Therefore, the 100 watts ultrasonic device (20kHz) was operated in pulsed mode (cycles: 5 sec. on followed by 5 sec. off). Best results were achieved for ultrasonic extraction in with 40% ethanol for 1h at 30°C. To compare the results with a conventional extraction methods, water bath and ultrasound bath extractions were also carried out. Results showed that the optimization of vanillin extraction by ultrasonic horn with 40% ethanol for 1h at 30°C was comparative to water bath extraction with 40% ethanol at 56°C for 15h. Rasoamandrary, N.; Fernandes, A. M.; Bashari, M.; Masamba, K.; Xueming, X. (2013): Improved Extraction of Vanillin 4-Hydroxy-3-methoxybenzaldehyde from Cured Vanilla Beans Using Ultrasound-Assisted Extraction: A Comparison of Ultrasound-Assisted and Hot Water Bath Extraction. Akademik Gıda 11/1, 2013. 6-12. For the ultrasonically assisted extraction of phenolic compounds of jujube (Ziziphus Jujube), a high intensity probe-type ultrasonicator UP200H with 200W power and 24kHz frequency was used. The ultrasonic device was equipped with the micro-tip sonotrode S2 (tip diameter 2 mm), which was immersed in a water bath in which a precipitate glass with the sample was placed (internal dimensions: 280:195:135 mm). Amplitude of ultrasonic vibrations was 100% of nominal power (maximum amplitude of 260 μm) and acoustic power of 0.171402 W and intensity of 21.8346 W/cm2 .The ultrasonic intensity was determined calorimetrically by measuring the time–temperature increase of the suspension under adiabatic conditions. The ultrasonic extraction procedure was used for the extraction of total phenolics from samples according to the experimental design (for optimization). Fooladi, H.; Mortazavi, S. A.; Rajaei, A.; Elhami Rad, A.H.; Salar Bashi, D.; Savabi Sani Kargar, S. (2013): Optimize the extraction of phenolic compounds of jujube (Ziziphus Jujube) using ultrasound-assisted extraction method. IECFP 2013. 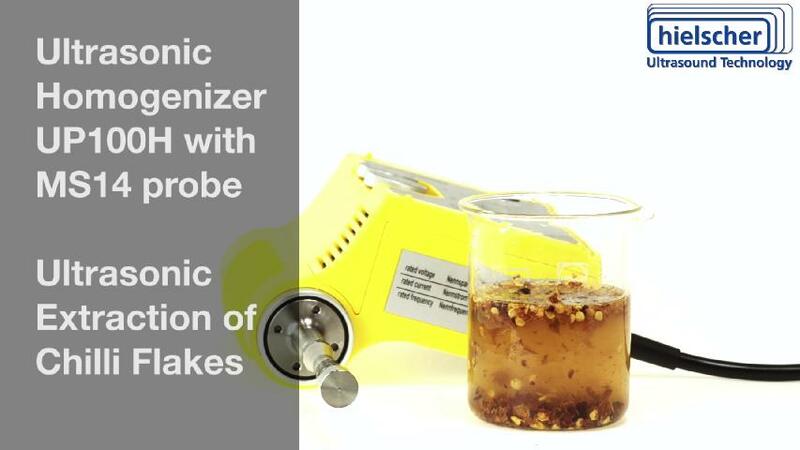 Click here to find more sonication protocols for the ultrasonic treatment of biological matter!